I am the WORST radio-changer you’ve ever met. Seriously, I know every song, but I will only listen to songs that I can sing along. With SiriusXM, my options are limitless. My tunes might be on Hits 2 or 50’s on 5 or Lithium 34 or Fly 47 or Prime Country on 58. Clearly my grooves vary across many genres of music! It was the summer of 1989; I was going into seventh grade. 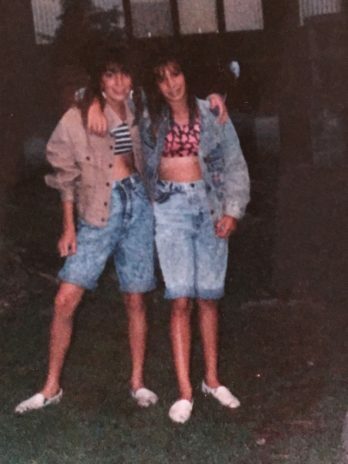 I had three big concerns at Camp that summer: running out of Stiff Stuff for my teased bangs (https://www.pinterest.com/pin/149181806385505396/), running out of D batteries for my boom box, and losing one of my 20 mix tapes that I worked really hard making all year long! In the background I heard the Steve Miller Band playing The Joker, which was my counselor’s favorite song. I was getting ready for the costume party where my friend Samantha and I were dressed up as Tigra & Bunny from the group L’Trimm, you know that awesome Miami female duo who brought us the hit, Cars That Go Boom: https://www.youtube.com/watch?v=2T3egCDI4ls. As if you haven’t already questioned my taste in music just from my favorite SiriusXM stations alone, check out my outfit that I thought made me look like Tigra (Samantha was Bunny)! Nothing says 1989 better than this photo! This is it! This is MY Camp Soundtrack from my favorite summer: 1989! I am nostaligic just writing this playlist down, and I am going to go ahead and create this playlist with all of my favorites! Fast forward to 2016, and I am trying to think about what will be the songs of the summer. Will it be Stressed Out (I hope not) or Work or Hello or My House or will we bring back something old school like Happiness Runs? What will make the soundtrack for our campers in 25 years from now when they think back to 2016? I can’t wait to find out! Here’s to an awesome summer that is filled with music that is WAY better than some of the music I grew up with at Camp (aka Debbie Gibson)!